One of Our Bird Monitoring Stations is 25 Years Old! Klamath Bird Observatory’s Pacific Crest Trail #1 (PCT1) long-term bird monitoring station, operated in partnership with Klamath National Forest, turns 25 this May—older than some of this year’s volunteer interns! The station’s resilience was recognized in the latest MAPS Chat—the annual newsletter of the Monitoring Avian Productivity and Survivorship Program to which we contribute data collected at all of our monitoring stations. The station is located within Klamath National Forest at the confluence of Seiad Creek and the Klamath River (in northern California near the town of Seiad Valley and the Pacific Crest Trail). It was first established by John Alexander (KBO Executive Director) who was a Biological Technician on the Klamath National Forest at that time. Sam Cuenca (Klamath National Forest District Biologist) was there from the start and maintains operation for the station to this day. 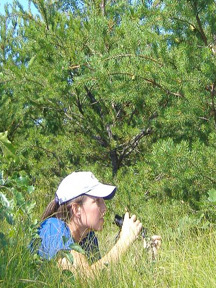 The Institute for Bird Populations created the continental-wide Monitoring Avian Productivity and Survivorship Program in 1989 and currently has over 300 contributing banding stations. Click here to view this issue of MAPS Chat – the PCT1 station recognition and a surprise 1993 photo of John and Taylor Alexander are on Page 9! 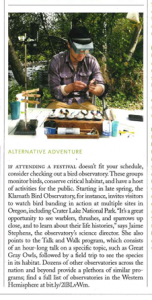 Klamath Bird Observatory was highlighted in the latest Audubon magazine. The Spring 2017 issue’s Travel section suggests our Community Education Programs as an Alternative Adventure. Pictured is 2015 student volunteer intern Daniel Gómez banding a bird at our Willow Wind Community Learning Center ecological monitoring station located in Ashland, Oregon. Photo by (2015 intern) Erica Gaeta. If attending a festival doesn’t fit your schedule, consider checking out a bird observatory. These groups monitor birds, conserve critical habitat, and have a host of activities for the public. Starting in late spring, the Klamath Bird Observatory, for instance, invites visitors to watch bird banding in action at multiple sites in Oregon, including Crater Lake National Park. “It’s a great opportunity to see warblers, thrushes, and sparrows up close, and to learn about their life histories,” says Jaime Stephens, the observatory’s science director. She also points to the Talk and Walk program, which consists of an hour-long talk on a specific topic, such as Great Gray Owls, followed by a field trip to see the species in its habitat. Dozens of other observatories across the nation and beyond provide a plethora of similar programs; find a full list of observatories in the Western Hemisphere at bit.ly/2lBLvWm. Click here to visit Audubon.org and to view the Spring 2017 online issue. Tropical forests are used by local people for food, timber, and resource extraction. Balancing the needs of local people and the needs of sensitive wildlife has presented scientists with pressing global conservation challenges. To help protect and manage tropical wildlife, Klamath Bird Observatory Research Associate Dr. Jared Wolfe has partnered with academia, governments, and nonprofits in Central Africa and Central America to successfully develop and fund several capacity building grants focused on conserving important habitats at risk of being lost. A Call for Citizen Scientists! 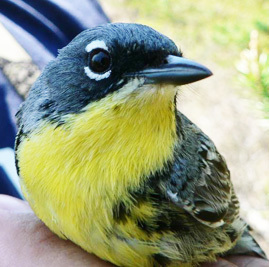 Klamath Bird Observatory and The Selberg Institute are launching a new citizen science project on the beautiful Sampson Creek Preserve just outside of Ashland. This project offers something for all birders and outdoor enthusiasts. Participants will have the choice to bird on fairly flat terrain walking less than two miles through meadows and oak woodland, or for the more adventurous there are little-explored areas off-trail along a gradient of different habitats. The project will take place on a large parcel of private property along Sampson Creek. The Preserve is in the foothills of the Cascades and holds a variety of oak habitats as well as coniferous forests and riparian woodlands. This is a terrific spot for birding and will give the public a unique opportunity to visit and bird in a diversity of habitats managed for conservation. Citizen Scientists will participate in a training event on April 15th to learn how to collect data, and the opportunity for monthly surveys will continue throughout the year. If you enjoy looking for owls, you are in luck as well. This project will also include guided night surveys to inventory the local owl population. Participation will include some walking and/or hiking, recording all birds observed by sight and/or sound, and entering and submitting your findings into eBird Northwest. Klamath Bird Observatory has completed baseline breeding surveys on this property in the past, but with this project we aim to add to the existing knowledge by harnessing the power of Citizen Scientists to collect robust data throughout the breeding, migratory, and winter seasons. If you are interested in participating or would like more information please contact KBO biologist Ellie Armstrong at eea@KlamathBird.org. Ellie will give a short presentation on the project at the next Rogue Valley Audubon Society monthly meeting on March 28th – come learn about this special place and what we can do to help keep it special. Peer-reviewed science is nonpartisan. While science is non-advocacy in nature, scientific results ensure fact-driven debate and informed decision making. In this time when our colleagues are being silenced, science is being dismissed, and funding is being cut, Klamath Bird Observatory remains steadfast in standing up for science. And today, right now, science needs you. Your support is more important than ever. Our science provides the foundation for conservation of our most at-risk bird species and the habitats on which all wildlife depend. In the last six months alone, our science has influenced state policy to eliminate red tape for oak restoration on private lands, informed the expansion of the Cascade-Siskiyou National Monument, and contributed to the petition to list the Oregon Vesper Sparrow under the Endangered Species Act. These are just a few examples of how our work is having an impact. But there is so much more to do! Please consider joining our monthly sustained giving program. For less than the cost of a daily latte ($50/month), or cup of coffee ($25/month), you can ensure that Klamath Bird Observatory’s science is at the table when decisions are being made. Your monthly contribution will provide staff time to put our science in front of decision makers at all levels. The reliable monthly revenue from you, our loyal supporter, will ensure that we can stand up for science during this unprecedented time in our nation’s history. To mark the 100th anniversary of the Migratory Bird Treaty, the North American Bird Conservation Initiative has published the State of North America’s Birds report. Through a groundbreaking collaboration between the United States, Mexico, and Canada this report evaluates birds of nine key ecosystems across the continent. The report highlights two key aspects of bird conservation that are core to Klamath Bird Observatory’s science, education, and partnership efforts in southern Oregon and northern California. First, science driven conservation works, and second, our continent’s birds still need our help. The Report’s authors found that where an investment is made in healthy habitat management, birds are doing well; and healthy birds mean healthy ecosystems. They provide several examples, including southern Oregon’s Klamath Siskiyou Oak Network collaboration of Lomakatski Restoration Project, Bureau of Land Management, USDA Natural Resource Conservation Service and Forest Service, The Nature Conservancy, US Fish and Wildlife Service, Klamath Bird Observatory and others. 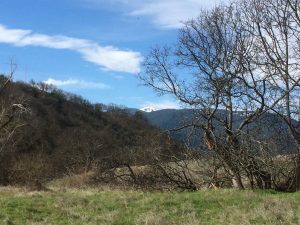 The Klamath Siskiyou Oak Network has leveraged $4.5 million of combined federal and non-federal resources to restore over 3,000 acres of oak woodlands across our region, with another 3,000 acres to be restored by 2020. This work is being guided by and evaluated with KBO research and monitoring using oaks-associated birds as indicators of success. The Report also presents a Watch List that identifies one third of North America’s bird species as high risk, including the Olive-sided Flycatcher. Klamath Bird Observatory research shows that in our region the Olive-sided Flycatcher is associated with fire and related forest conditions. This is just one example of the many indicator species that Klamath Bird Observatory studies, with results informing forest management. The State of North America’s Birds report emphasizes the importance of such studies, because quality, not just quantity, of our temperate forests, is critical for forest birds. In the West, fire plays a key role in maintaining high-quality forest ecosystems, and Klamath Bird Observatory is working to show how this understanding, and the use of birds as indicators, can inform management our western forests. This application of science and bird conservation priorities to address pressing forest management challenges, with an intention to protect and restore our forests, and thereby stop the steepening declines of our western forest birds. This new State of North America’s Birds report is a call to action. Of North America’s 1,154 bird species, 432 are now considered of “high concern” due to low or declining populations and growing threats from habitat loss, invasive predators, and climate change. 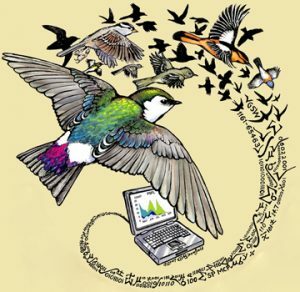 Migratory birds connect people to nature and provide multiple benefits – ecological, economic, agricultural, aesthetic, and recreational – for people and the natural environment. Therefor our governments, industry, and the public must once again come together to support migratory bird conservation. The 2016 Report and past State of the Birds reports archive are available at www.StateOfTheBirds.org. Klamath Bird Observatory, based in Ashland, Oregon, is a scientific non-profit organization that achieves bird conservation in the Pacific Northwest and throughout the migratory ranges of the birds of our region. We developed our award-winning conservation model in the ruggedly beautiful and wildlife-rich Klamath-Siskiyou Bioregion of southern Oregon and northern California, and we now apply this model more broadly to care for our shared birds throughout their annual cycles. Emphasizing high caliber science and the role of birds as indicators of the health of the land, we specialize in cost-effective bird monitoring and research projects that improve natural resource management. Also, recognizing that conservation occurs across many fronts, we nurture a conservation ethic in our communities through our outreach and educational programs. The U.S. North American Bird Conservation Initiative (NABCI) Committee is a forum of government agencies, private organizations, and bird initiatives helping partners across the continent meet their common bird conservation objectives. The Committee is working to secure a bright future for North America’s more than 1,150 species of birds, in conjunction with NABCI partners in Mexico and Canada to increase cooperation and effectiveness of bird conservation efforts among the three countries. The NABCI Committee’s strategy is to foster coordination and collaboration on key issues of concern, including bird monitoring, conservation design, private lands, international collaboration, and state and federal agency support for integrated bird conservation. Beavers, like humans, are engineers of their own habitats, carrying out construction projects that make more food resources and housing available to them. Recently, beavers have been recognized by land managers as playing a vital role in maintaining diverse stream and riparian habitats. The benefits of beaver impoundments in a watershed include slowing and spreading the flow of water, improving water retention and groundwater recharge, increasing base flows, and lengthening the time in summer when above-ground flows are present. Given that climate change is expected to increase drought and reduce snow pack, water storage from beaver dams may be an effective way to help offset decreased water resources. Beaver dams can also expand the size and complexity of wetlands, providing important habitat for birds, fish, aquatic invertebrates, mammals, and amphibians. Ironically, after decades of trapping and removing ‘pest’ beavers, they are now understood to be a keystone species vital to the health of the land. 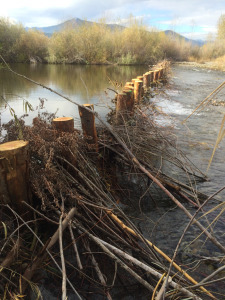 Beavers have been successfully reintroduced to public and private lands in Washington and Utah to control erosion, capture water during droughts, and improve salmon fisheries. This fall, KBO entered into a new partnership project with the Scott River Watershed Council near Etna, CA, to monitor ecological changes resulting from the creation of PAWS (post-assisted woody structures) — PAWS are built by people to mimic the beneficial effects of beaver dams. KBO is monitoring changes in bird abundance and diversity at PAWS sites to assess the success of these restoration efforts. Past studies of beavers in New York and Arizona show that active beaver sites, and all of their associated habitat complexity, support more species of birds than sites without beavers. Our partners at the Scott River Watershed Council are also monitoring the effects of PAWS on water quality and quantity, and are ensuring that the short, permeable structures are not barriers to fish passage. So, why not just “leave it to the beavers?” Actually, not all beavers build dams. Some dig bank burrows into the earthen sides of a waterbody or river channel to create their lodges, particularly on deep lakes, larger rivers, and in places where water flows are too fast to build stable dams. Many beavers observed in the Scott River Valley seem to fall into this category of “bankies”. However, permeable wood structures with water flowing through have been known to be too tempting for beavers to resist. The rushing water can actually trigger dam-building behavior, so the area’s resident beavers may soon be helping humans restore streams in the Scott River valley! Co-supervisors: Dr. Karen Hodges, University of British Columbia Okanagan, and Dr. Christine Bishop, Environment Canada. Many riparian birds in Canada occur at the northern edge of their range. There is little understanding of the overwintering locations, return rates, and survivorship of these birds relative to those in the core of their range. This research will primarily examine the range-wide patterns in overwintering locations and the factors that influence migration trends in riparian birds that nest in the dry interior of British Columbia (BC) and in Northern California. 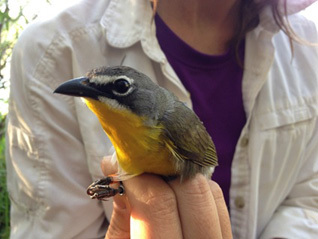 This PhD position is designed as a comparative study of populations of two focal species, Gray Catbird, and Yellow-breasted Chat (endangered in BC). The student will use geolocator data, stable isotopes, corticosterone, and mercury analyses in collaboration with Mexican partners to identify overwintering locations, travel corridors, and stressors affecting these populations. Preferred Qualifications: We are seeking a student with an MSc in ecology, biology, conservation, or related disciplines. We will look favorably on research experience with birds, including practical skills in bird banding and handling and identification. The successful applicant will have strong grades, likely with peer-reviewed journal publications, and GIS and statistical skills. We expect the successful applicant will also apply for graduate fellowships. We ask all interested applicants to submit a cover letter, informal transcripts, and a CV to Dr. Hodges for initial screening (for full consideration, submit materials before December 15). Highly qualified candidates will be encouraged to apply formally to UBC Okanagan’s Biology Graduate Program for September 2016 admission; we strongly hope the student will be able to begin fieldwork in May 2016.